Transpired Solar Collectors help to improve the energy efficiency and the environmental performance of a building by converting solar energy into heat energy and preheating the ventilation air to a building. This preheated air can help to reduce the fuel required to heat a building by up to 50%. The Transpired Solar Collector system has been used in North America and Canada for over 20 years and has proven to have the shortest payback of any renewable technology of between 3 to 7 years. These short payback periods are achievable through a highly thermal efficient system coupled with the low cost of the Transpired Solar Collector, which is in effect a single sheet of perforated steel. As part of the development team working with TATA Steel, Kimpton Energy Solutions have designed and installed a number of these systems on different types of building and are excellently placed to offer you advise on how this system can be used to improve the energy efficiency of your building. 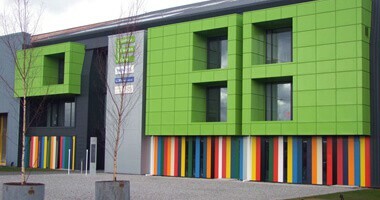 The SBEC (Sustainable Building Envelope Centre) in Deeside is a pioneering partnership between the Low Carbon Research Institute, TATA Steel and the Welsh Assembly that will test, monitor and evaluate various low carbon technologies in different combinations to help inform specification decisions for both new build and refurbishment projects. The three-year research project has been designed to investigate the next generation of low carbon whole building solutions to help create a blueprint for the most effective use of renewable energy technologies. The building comprises various office spaces and facilities located across the ground, first and second floors. The heating and cooling to these areas is to be provided via a combination of sources, a full building energy management system is required to ensure the most efficient use of these energy sources. The Transpired Solar Collector also delivers energy as a primary heat source which has to be factored into the overall operation of the building services. Kimpton Energy Solutions were responsible for designing and installing the VRF system, hot water services, rain water harvesting, gas fired heating system and the full BEMS network as part of the energy efficient installation. The facilities on the three floors are heated and cooled by a Mitsubishi VRF heat pump system and the Transpired Solar Collector (TSC) is used to temper the incoming air. For the VRF system Kimpton installed four air handling units complete with DX refrigeration coils, which have been integrated into the VRF system. An additional VRF system has been provided to heat/cool the meeting rooms and circulation areas via fan coil units, along with a Mitsubishi Heat Pump Boiler to provide under floor heating with water at 45°C flow temperature. The hot water system features a Stiebel Eltron hot water heat pump that utilises air from within the room and extracts the thermal latent energy which the heat pump uses to warm the water in the cylinder. The SBEC test bay is provided with warm air in the winter months via a gas fired air heating system connected to a network of ducts. Surplus heat from the TSC is used to warm this air before the gas is used, thus helping to reduce the consumption of natural gas. Kimpton Energy Solutions also installed a Rainwater Harvesting system to provide water to the staff and visitor toilets.